ChiroPlanet.com has been delivering cutting-edge, customizable website designs with pre-loaded content to the chiropractic community for over 15 years. With integrated email marketing, one-on-one support and forward thinking web marketing services including reputation management, social media management and local search engine optimization, ChiroPlanet.com maximizes your online presence and converts clicks into patients. Find out how they can help you, call or visit ChiroPlanet.com to request a consultation. Founded, owned and operated by chiropractor Dr. Neil MacKay, ChiroPlanet offers a complete solution for the website requirements of any size of practice or facility. From the time you sign up with them, you can have a fully built website, with custom content and features, in as little as 24 hours. 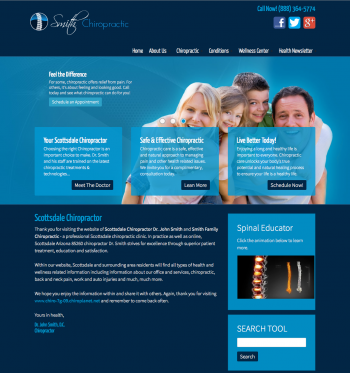 ChiroPlanet.com provides professional website design, with powerful and dynamic features and enhancements, to not only suit the needs of your practice and target demographic but also to fit your budget. Your website is pre-loaded with several hundred or more pages of expertly written chiropractic, health and wellness related content, all ready to go the moment your site goes live. ChiroPlanet's website management system helps you keep your website content current and pertinent to your practice needs, and helps you control virtually all aspects of your website. And it is fully backed by first-rate customer support to help you get the best possible results from your website, enabling you to increase your office efficiency, attract new patients, and maximize your current patient base. ChiroPlanet.com has a team of experienced internet consultants ready to work with you. For further information, call the company, email them at info@ChiroPlanet.com or visit their website.